As the shadowy elite try to silence free speech, Fellowship of the Minds quietly crosses the line of half a million page views. It’s not long since WordPress attempted to choke out Fellowship of the Minds. We quickly moved to a better hosting company and opened up again. 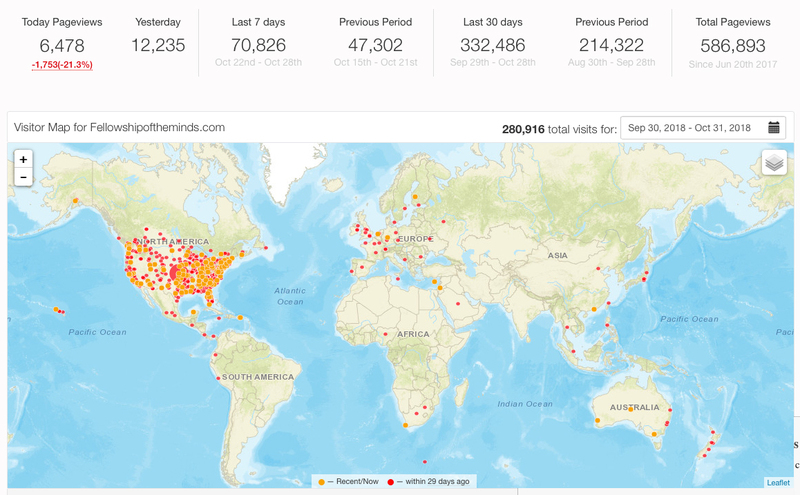 Before the attack, FOTM had amassed more than 38 million pageviews. And now in just a few weeks we have had 586,893 Pageviews. That means we are still here, and still speaking. God is good. This entry was posted in Conservatives, Culture War, war on Christianity, war on patriotism and tagged FOTM, still alive. Bookmark the permalink. If we are now on a different hosting company, why do my incoming e-mails from FOTM still come addressed from “donotreply (at) wordpress.com”? Hustle, hit, never quit! You cannot keep a good deplorable down. We are in it to win it and that is just what we will do. Hat tip to Whatfinger for leading me here. When I saw the page header I knew it was a good day on the interweb tubes. Truth will always prevail over left wing censorship. I have been reading FOTM for years, and I especially like the animal stories. It was like being punched in the gut when I found 0ut WordPress tried to murder your site. Then it was a happy day when I discovered you had returned. Thank you for persevering. I like how the map shows MANY of us here in the center of our nation viewing/writing here, but ALSO from both coasts and across the globe! Most (very) glad to be an active part of the DAILY FOTM Subscribed Readers! Such quality writing is so much more than I feel I deserve, but serve it up, for we love it each and every day received. My Dear Dr. E, you must surely have Writers (keyboard) Finger Cramps of late! You have been writing so very much and such great pieces, one after glorious one. I can’t wait to see what you are writing about each new day! A H/T to you, my cherished friend. Thank you to all the commenters for your encouraging words. You and all our readers were the buoy that kept FOTM afloat during the transition between WordPress burning down FOTM — the digital equivalent of an entire library — and our restoration.